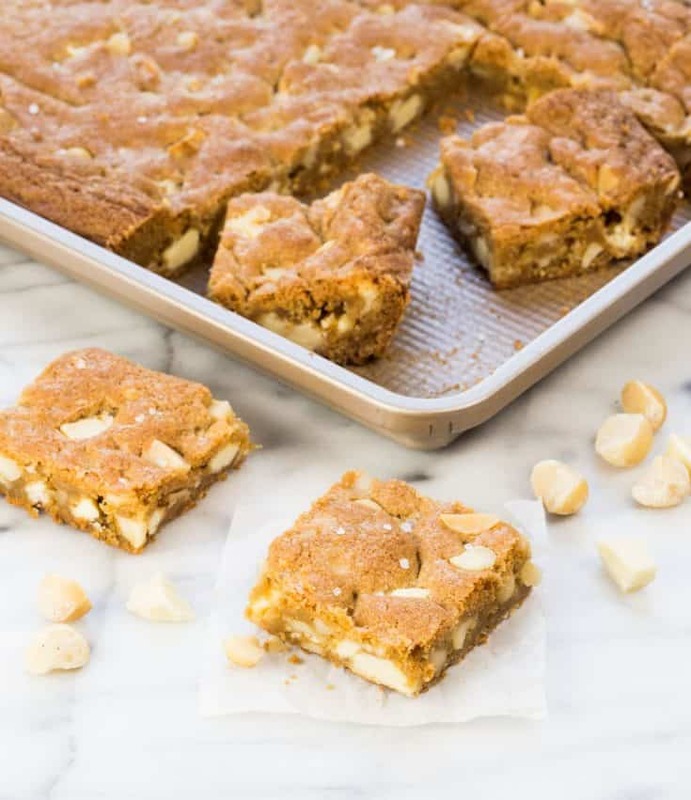 Change up your cookie craving with a pan of these sweet and salty White Chocolate Macadamia Nut Cookie Bars – the perfect picnic or BBQ dessert recipe. True confession: I could give or take white chocolate on its own. It just doesn’t hold the same allure to me as rich dark chocolate. But nestle it alongside some buttery macadamia nuts and an irresistible cookie base, and suddenly I’m reaching for seconds (okay, maybe thirds). I think quite a few people feel the same way that I do, so go ahead, test my theory. 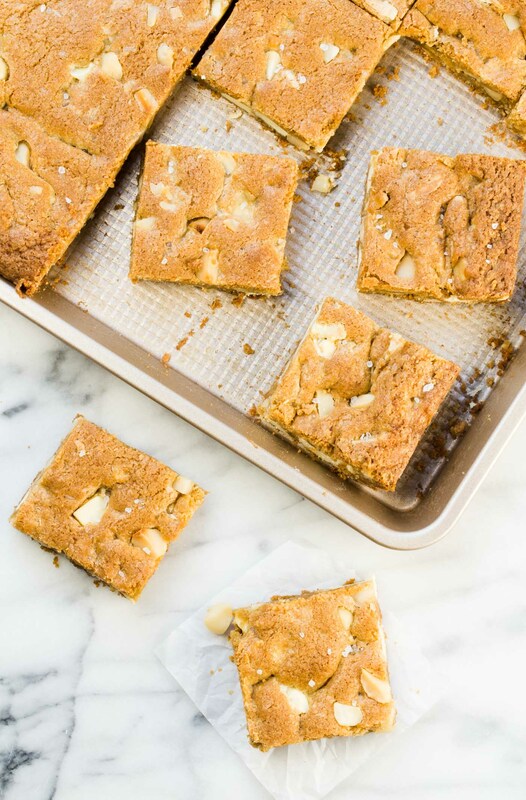 Bake a pan of these White Chocolate Macadamia Nut Cookie Bars and see. My guess is they will go over big time at your next potluck. Cookies are great, don’t get me wrong, but I love the convenience of bar cookies. There is no waiting for the cookies to cool enough to remove them from the sheet pans (or for the sheet pans to cool enough for the next batch). With these White Chocolate Macadamia Nut Cookie Bars, it’s just one pan and 20 minutes in the oven. Done. Instant time saver! And the result is a thick, rich, chunky cookie bar with a crispy crust and a moist middle – pretty much my definition of cookie nirvana. I always make my bar cookies in this jelly roll pan. The little ridges at the bottom ensure your bars release easily every.single.time. Tip: I used unsalted nuts in this recipe, so I like to sprinkle a tiny bit of coarse sea salt on top of the bars before I put them in the oven to ensure that every bite of cookie bar has that irresistible sweet and salty flavor combination. Omit this step if you’re using salted nuts. With summer nearly upon us, it’s time to get our picnic and BBQ menu items ready. Tuck this recipe for White Chocolate Macadamia Nut Cookie Bars in your files for those last minute invitations. They travel well, they feed a crowd, and their buttery sweet and salty flavor is pretty tough to resist. Preheat oven to 375 degrees. Lightly grease the bottom of a 10 x 15 jelly roll pan. Combine flour, soda and salt in a small bowl. Whisk to combine. Set aside. Place butter and sugars in a large bowl and beat until creamy. Add eggs and extracts and beat again until thoroughly incorporated. Stir in chocolate and nuts. Evenly spread batter in pan and sprinkle with sea salt, if desired. Bake for 19-21 minutes or until golden brown. Allow to cool completely before cutting into bars. Love!!! Macadamia nuts are some of m favorite! Especially with white chocolate!! Me, too, Jenni. I always buy more macadamia nuts than I need for this recipe because I know I’ll eat some as I make it!